CV Mod is a 2 LFO/VCO Oscillator Module meant to be used with modular or semi-modular synth hardware. Simply connect the headphone output of your iPhone or iPad to one or more CV or audio inputs on your hardware. To get the most out of this module, use a stereo breakout cable to separate the left and right audio channels. Just like that, you now have 2 additional LFOs or full range oscillators added to your rig! In the spirit of modular synthesis, you have complete control over each oscillator’s parameters via external MIDI. You can also modulate one oscillator’s frequency and phase with the other oscillator’s rate and depth controls. With two drawable wave table editors, you can create whatever crazy wave forms you like, unleashing a vast sea of possibilities. Instant grit! Intuitive controls via the main faders, XY pad, or MIDI CC make this an incredibly easy way to add more modulation and sound sources to your gear. Download now and have some good old-yet-new-fashioned creative fun! Separate glide controls for each oscillator, with a configurable maximum glide time of 120 seconds! CV Mod proudly uses the open source AudioKit framework for the oscillators and MIDI. Visit audiokit.io for more info. CV Mod is a 2 LFO/VCO Oscillator Module meant to be used with modular or semi-modular hardware. 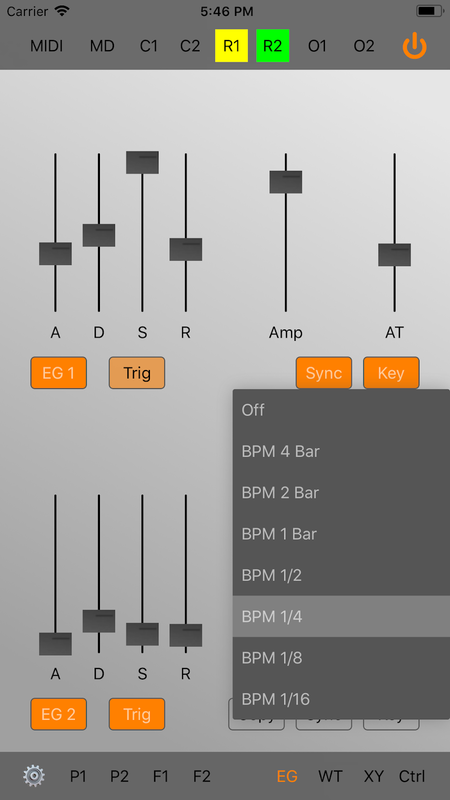 Simply connect the headphone output of the iOS device to one or more CV (or audio) inputs on your hardware. For best results, ensure that the volume of the iOS device is set to maximum. (Don't forget to turn the volume down afterwards!) To get the most out of this module, you should use a stereo breakout cable (a cable that can separate the left and right audio channels). By default, Oscillator 1 is mapped to the left stereo channel and Oscillator 2 is mapped to the right channel. This can be changed in the settings. Not hearing results? Be sure that everything is plugged in and that you've turned the power switch on. It's orange when on and black when off. 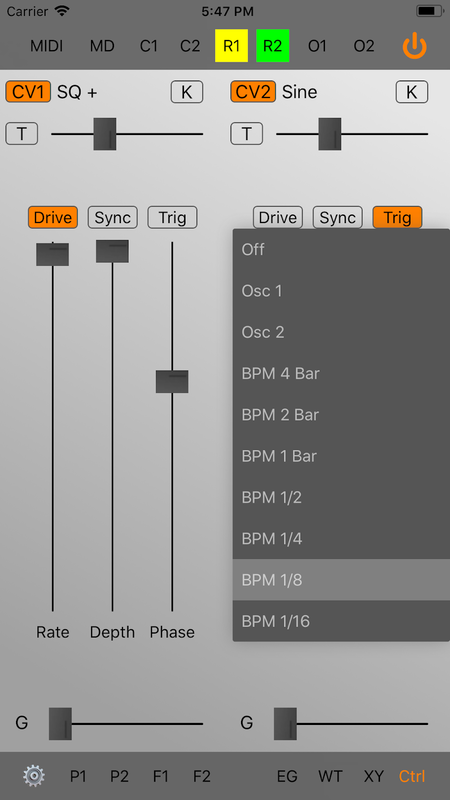 Connect an external MIDI source or multiple sources to control various parameters. For example, you might want to control an oscillator's frequency with the keys on a MIDI keyboard. 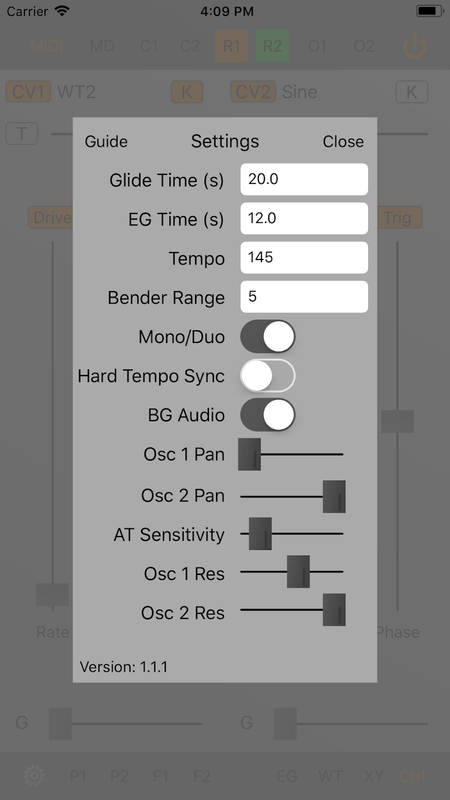 You could also map the pitch wheel, mod wheel, velocity, and aftertouch to control oscillator rates or the master depth. In addition, any incoming MIDI clock messages will automatically be used to override the internal clock and tempo. To disconnect a source, simply open the menu and tap on the source you wish to disconnect. Note: by default, any incoming pitch wheel messages will affect the rate of the oscillators. 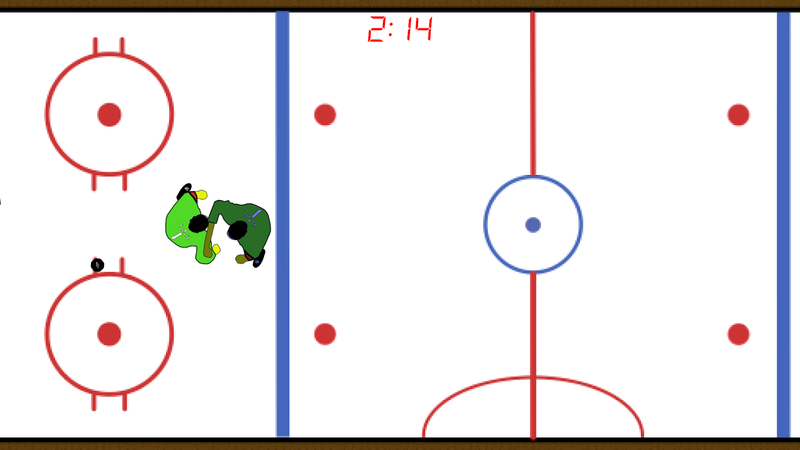 To disable this, set the Bender Range to 0 in the settings. 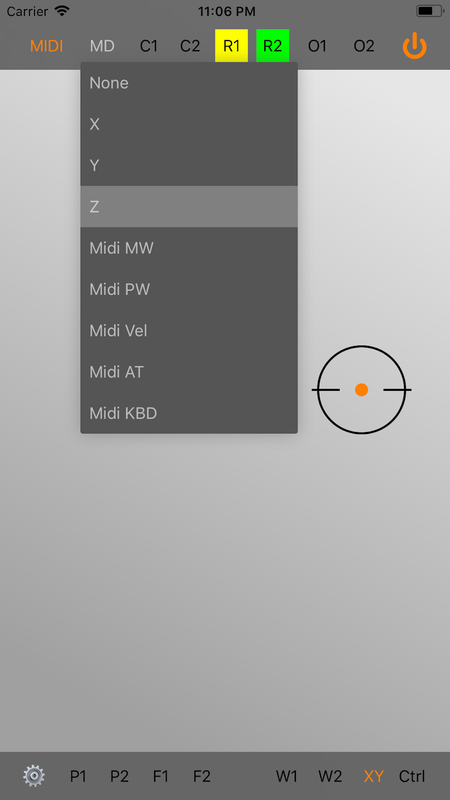 Use the Learn option to map a control to an incoming MIDI CC source. Simply select the control from the sub-menu that you want to map to, and then send a CC message (i.e., turn a knob) via an external MIDI source to complete the mapping. Control the master depth (output volume) with an external MIDI source or with the X, Y, or Z axis (pressure) of the XY pad. Control the rate (frequency) of oscillator 1 with an external MIDI source or with the X, Y, or Z axis (pressure) of the XY pad. Control the rate (frequency) of oscillator 2 with an external MIDI source or with the X, Y, or Z axis (pressure) of the XY pad. Set the upper limit of the frequency range of oscillator 1. If this is set to the highest level, labeled VCO, and C1 is set to Midi KBD, the frequency will be mapped to that of the corresponding MIDI note. Set the upper limit of the frequency range of oscillator 2. If this is set to the highest level, labeled VCO, and C2 is set to Midi KBD, the frequency will be mapped to that of the corresponding MIDI note. Set the wave shape of oscillator 1. WT1 and WT2 default to triangle if they haven't been set. You can also set the shape by tapping on the name of the wave shape in the Main Control view. Set the wave shape of oscillator 2. WT1 and WT2 default to triangle if they haven't been set. You can also set the shape by tapping on the name of the wave shape in the Main Control view. The rate and depth of oscillator 2 will be used to modulate the phase of oscillator 1. The rate and depth of oscillator 1 will be used to modulate the phase of oscillator 2. The rate and depth of oscillator 2 will be used to modulate the frequency of oscillator 1. The rate and depth of oscillator 1 will be used to modulate the frequency of oscillator 2. Open the Envelope Generator view. Open the Wave Table Editor to edit Wave Table 1 or Wave Table 2. The Main Control view provides controls for both oscillators. From here, you can control the wave shape, tuning, rate, depth, phase, and glide of each oscillator. You can also mute the audio output of an oscillator. Mute or unmute the output of the oscillator. This does not affect any modulation between the oscillators, it simply supresses the audio output. You can change the wave shape of the oscillator by pressing the shape name currently displayed. Fine tune the oscillator with the tuning slider. Press T to reset the tuning. Increase the scale of the oscillator's amplitude by a factor of 10. Please be careful when wearing headphones. Synchronize the rate of the oscillator to subdivisions of the current tempo. Send out a trigger pulse at a given rate. The rate can be that of the other oscillator or a clock subdivision of the current tempo. You can still use the fine tuning control. Control the rate (frequency) of the oscillator. Control the depth (output volume) of the oscillator. This is also used to control the depth of internal modulation between oscillators. Control the phase offset of the oscillator. Modulating the phase of a square wave produces an effect similar to pulse width modulation (PWM). Adjust the glide (portamento) time of the oscillator. The maximum time can be adjusted (up to 120 seconds) in the settings. Each oscillator has its own dedicated ADSR envelope generator, which can be used to modulate the amplitude to varying degrees. The maximum time for attack, decay, and release can be configured in the Settings. Sets the duration of the attack phase. Sets the duration of the decay phase. Sets the duration of the release phase. Increase or decrease the effect of the envelope generator on the oscillator's amplitude. Increase the effect of the envelope generator with MIDI Aftertouch messages. Enable or disable the envelope generator for the respective oscillator. Trigger the envelope manually by pressing the Trig button. When the Trig button is highlighted, it is either in the attack, decay, or sustain phase. Press Trig again to initiate the release phase. Trigger the envelope with subdivisions of the current tempo. Press Sync and select the subdivision you want. 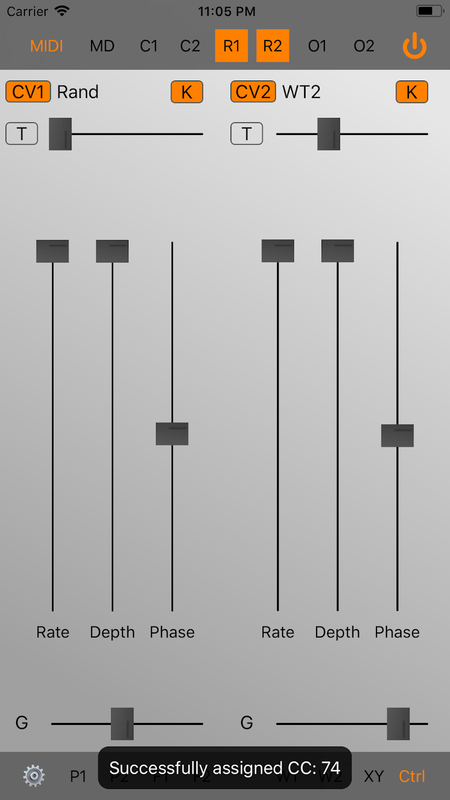 Trigger the envelope with MIDI note on/off messages. You can create 2 of your own wave forms with the wave table grid editor. 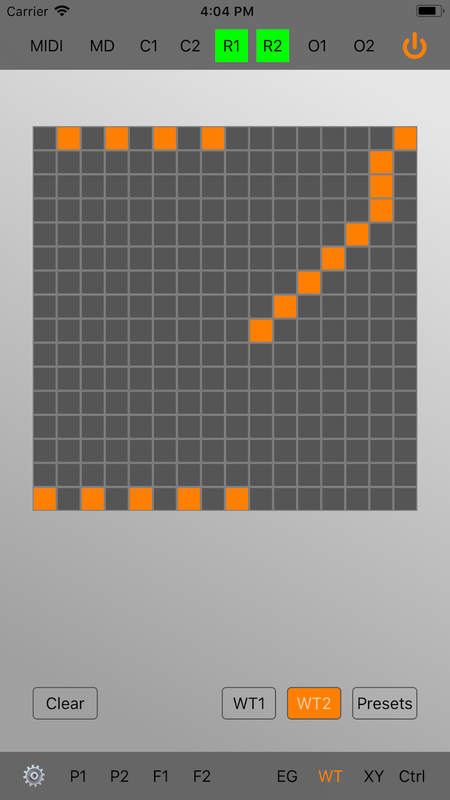 Simply drag your finger along the grid to create a wave shape. Press the Clear button to erase the currently stored wave form. Note: Your wave form must reach the end of the x-axis before it can be used. 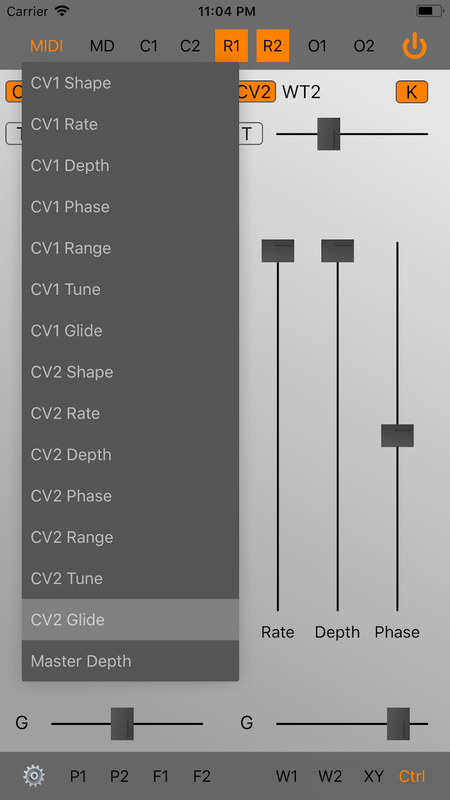 The XY pad can be used to control oscillator rates and master depth when mapped via C1, C2, and MD in the top menu bar. The Z-axis responds to touch pressure (not available on all devices). Tap the Gear icon to open the menu. Save presets by choosing Presets from the menu. 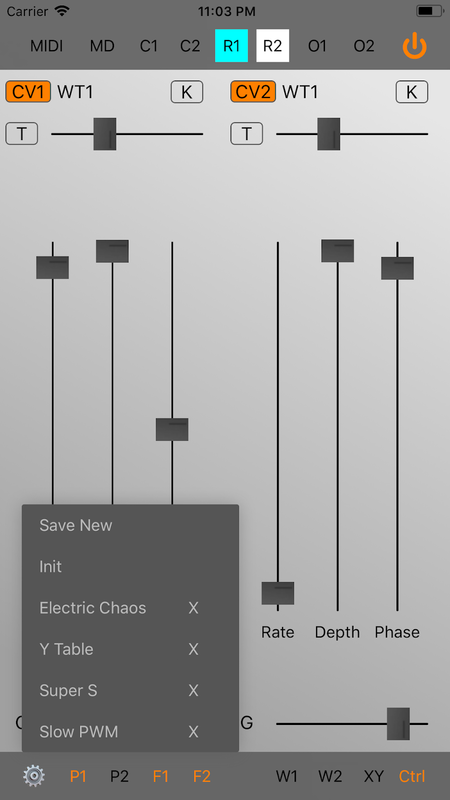 Choose "Save New" and enter a name to save a preset. Load a previously saved preset by tapping on the name. Delete a preset by clicking on the "X" button next to the name. Select "Init" to return to the default state. Sets the maximum glide time in seconds (up to 120). Sets the maximum envelope attack, decay, and release time in seconds (up to 120). Sets the internal tempo in BPM. This will be automatically overridden by any incoming MIDI clock source. Sets the maximum range allowed by incoming MIDI pitch wheel messages (up to 2 octaves). When both oscillators are in VCO mode and are set to be controlled by Midi KBD, enabling Duo mode allows you to play 2 notes at once. The lower note controls oscillator 1 and the higher note controls oscillator 2. In Mono mode, both oscillators will be set to the frequency of the last incoming note. Oscillators that are in LFO mode with sync enabled will restart every time a tempo change is detected. Audio output will continue when the app is put in background mode if this is enabled. Adjust the sensitivity for responding to incoming MIDI Aftertouch messages. Some MIDI keyboards transmit a wider range of values than others. Increase or decrease the bit depth of oscillator 1. Increase or decrease the bit depth of oscillator 2. 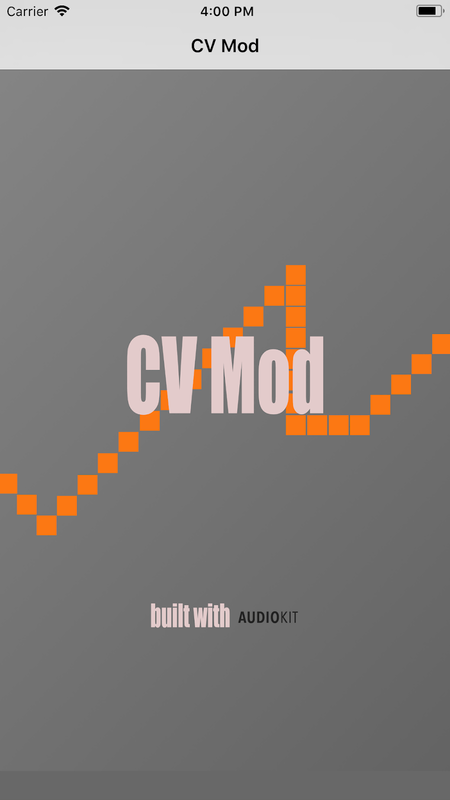 CV Mod proudly uses the AudioKit open source framework. Visit AudioKit.io for more info. 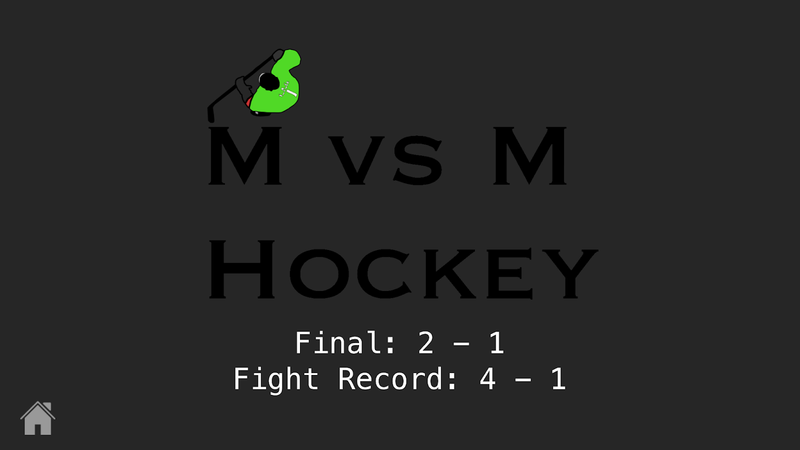 Copyright © 2018 Steven Connelly. All rights reserved. 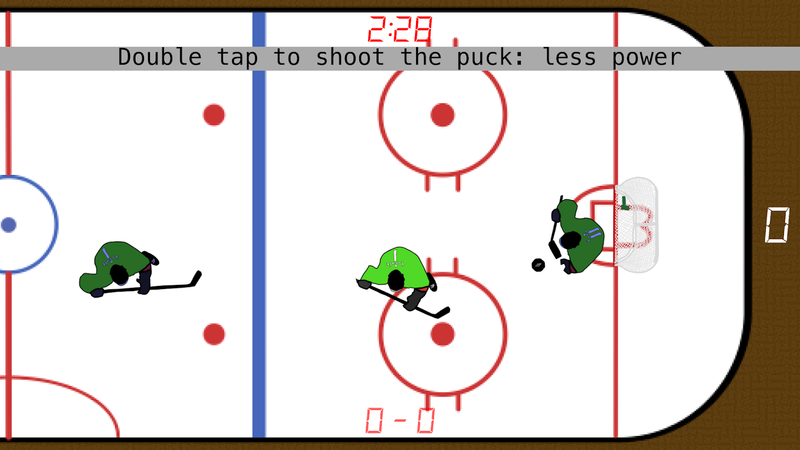 MvsM Hockey is a 3-minute, one-on-one hockey battle between you and a computer controlled player available on iPad, iPhone, and iPod Touch running iOS 8 and above. 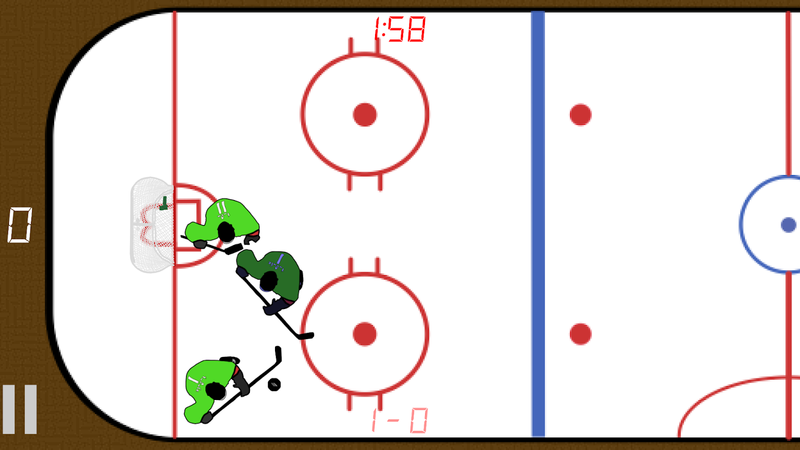 As you conquer each level throughout the game, you'll find that the opponent gets tougher and tougher. Shoot, check, and fight your way through to the top. 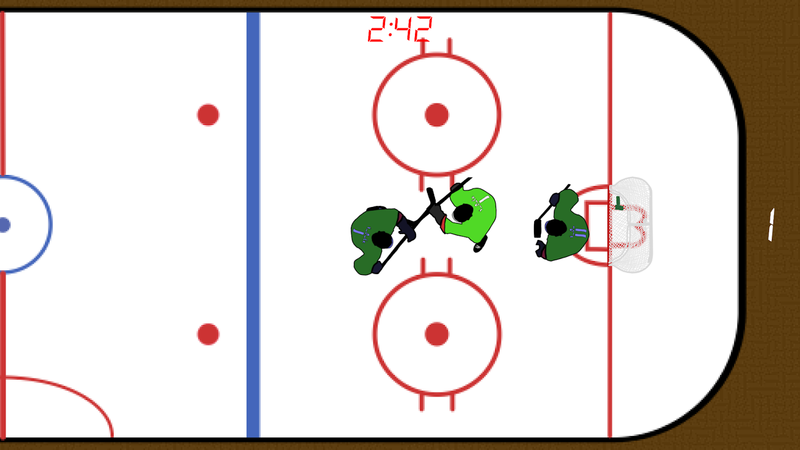 Beat the opponent at all levels and you'll win the game! See how many points you can rack up! Download from the App Store for free by clicking the button below. Copyright © 2016 Steven Connelly. All rights reserved.